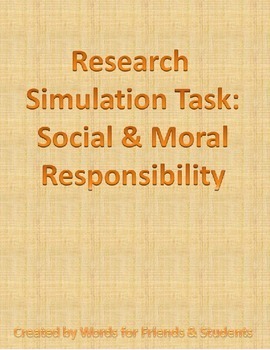 This is a synthesis essay/research simulation task (RST) addressing moral and social responsibility. The prompt includes excerpts from Harper Lee's To Kill a Mockingbird, Mark Twain's On Morality, and Elie Wiesel's speech On the Atrocities in the Sudan. 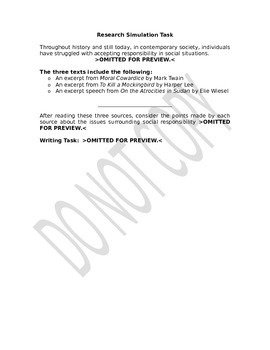 Great as an interim assessment with reading of any of the three author's as well as any thematic unit addressing moral and social responsibility as well as a final timed writing prompt.